SKU: SDS308PD. Categories: All Manual Toothbrushes, Butler GUM Manual Toothbrush, GUM Specialty Toothbrushes. A toothbrush specially designed to give you an ability to effectively clean between teeth and dental appliances with ease, comfort, and style! These toothbrushes are comfortable to hold and effectively clean spots that most toothbrushes miss. The Butler Gum End Tuft toothbrush screams comfort and is the perfect tool for precise cleaning between teeth and various dental appliances. Best of all, the GUM End Tuft Toothbrush features a comfortable rubber grip – something that is missing from traditional End Tuft toothbrushes. The head of the toothbrush is a very small circular shape with a distinct 7 sprouts of bristles that point precisely up and are shaped to create a pointy tip of bristles designed to get in the trickiest of places. As you go down from the head of the toothbrush, you will notice the toothbrush becomes thicker and a rubber grip emerges. The rubber grip is ribbed and shaped in such a way to guarantee you maximum comfort. The grip looks like one you would find on a fancy writing utensil made to lessen hand fatigue. Further down, the ribbed grip smoothens out and the handle becomes thicker and even more comfortable to hold. A bit lower down, the letters which many recognize as a leader in oral health “G U M” are engraved and the absolute tip of the handle has a hook design to further ensure your comfort. The thicker handle and the carefully designed angle of the toothbrush makes sure that you hold the toothbrush at the correct 45 degree angle that is optimal for brushing. The majority of people who take advantage of this toothbrush enjoy its specifically placed, professionally engineered bristles that make getting into tight places a breeze. Cleaning out food or debris from hard to reach places becomes a snap and with the new thick rubber handle, it’s more comfortable than ever. The majority of regular end tuft toothbrushes have several rows of bristles and a flimsy plastic handle that is not particularly comfortable to hold. GUM itself once created an end tuft toothbrush that fit this profile. But what an improvement they have made with their new model! After extensive searching and trying to find the best end tuft toothbrush, it became evident that GUM produces the very best end tuft toothbrush available today! comfort and engineering that you didn’t expect from an end tuft toothbrush. 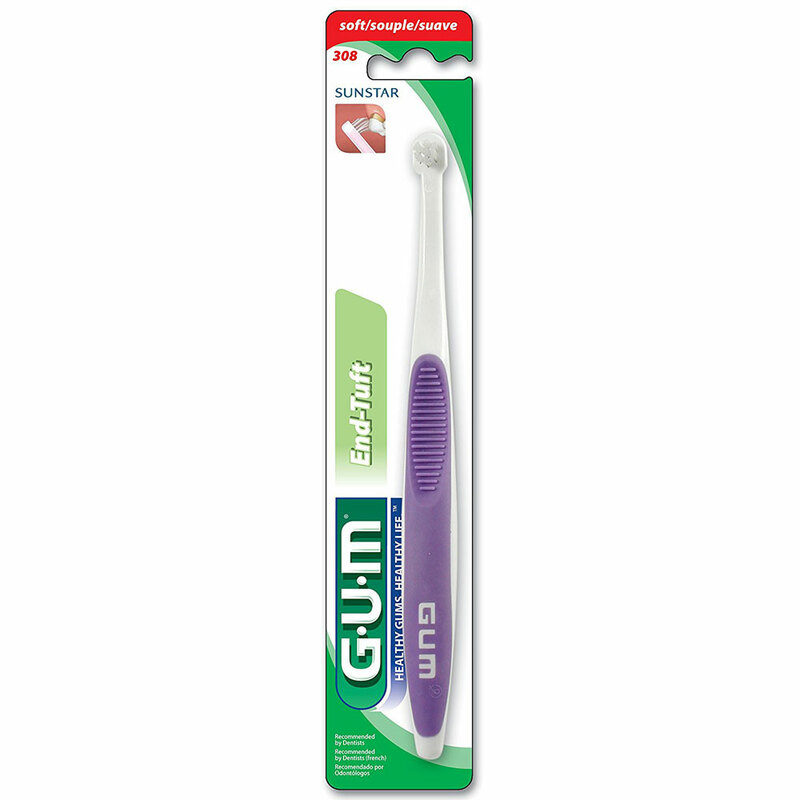 The surgical grade plastic, the smooth rubbery grip, the soft antibacterial bristles will surely impress you and will make you a lasting fan of GUM End Tuft Toothbrushes. Your initial interest in the toothbrush will certainly be confirmed when you begin to use it, and cleaning around orthodontic bands, furcations, implants, back teeth and other hard to reach places becomes effortlessly easy. Quite simply, after meeting the GUM end tuft toothbrush, you will have encountered the best end tuft toothbrush available today. 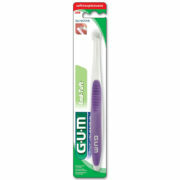 that help you clean between teeth and provide maximum control over your brushing experience. A thickening rubber grip with ribbing on both sides of the handle for maximum comfort and control. High quality and durable plastic skeleton made of firm surgical grade plastic. The majority of those who have taken advantage of this toothbrush come back for it often and use it religiously claiming that it has helped to remove particles between teeth and has improved overall gum health as well as dental visits. Several dentists we have talked to are for this type of toothbrush because of its highly small brush head and convenient bristle design. To read actual testimonials, or to write one yourself, go ahead and scroll down to the bottom of the page where you should find a way to rate the product and read/write testimonials about it. Have a great day and continue to brush and floss daily for maximum oral health and the smile of a lifetime. my dentist gave one to me and inside of 1 week he could see the difference in my gum. Now where can I buy some? Do you plan to stock them?